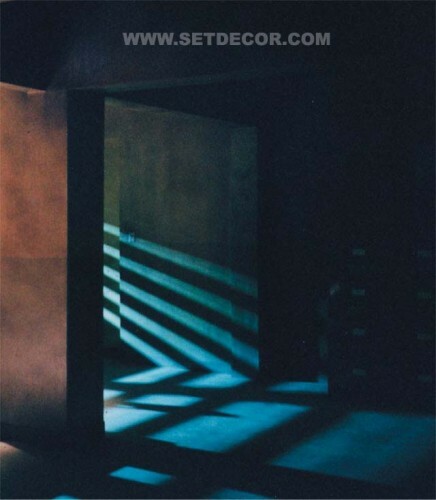 James Dean, Set Decorator, Leslie Frankenheimer, SDSA, Photo by Doug Hyun; courtesy of Turner Films Inc.
creating a murder scene for a one hour drama, set decorators have the challenge of how to give a quick visual presentation of where you are and what the story is about. 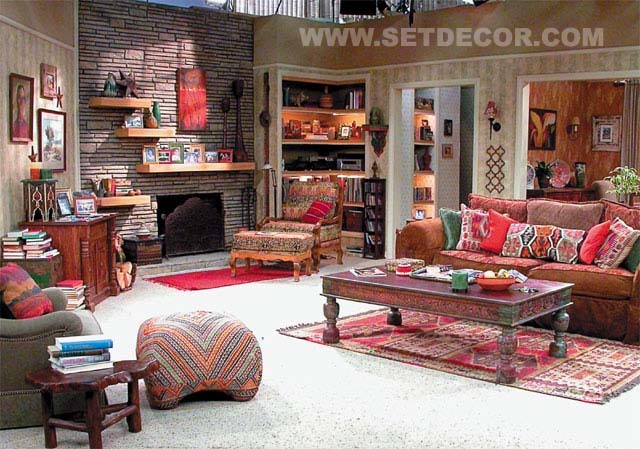 From sitcoms to reality shows to episodic drama and film for television, these pages offer a glimpse of set decorators' work for the world in a box. She’s Got Legs…A long running show offers the opportunity to not only develop signature sets, but to also have fun with swing sets and one-timers. Changes in storyline allow for new permanent sets, as well. 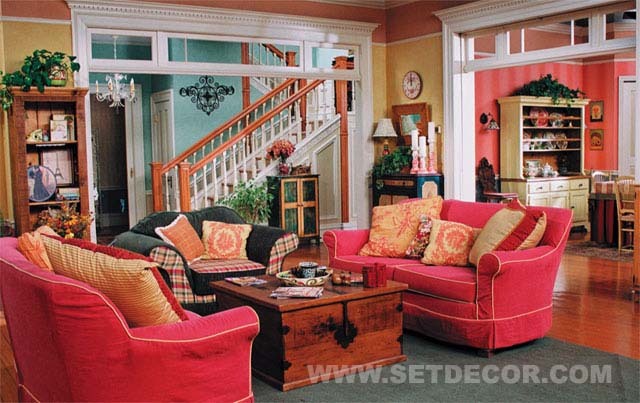 Right and above: Newly redecorated living room signature set and new permanent office set for SABRINA, THE TEENAGE WITCH, decorated by Julie Kaye Fanton. 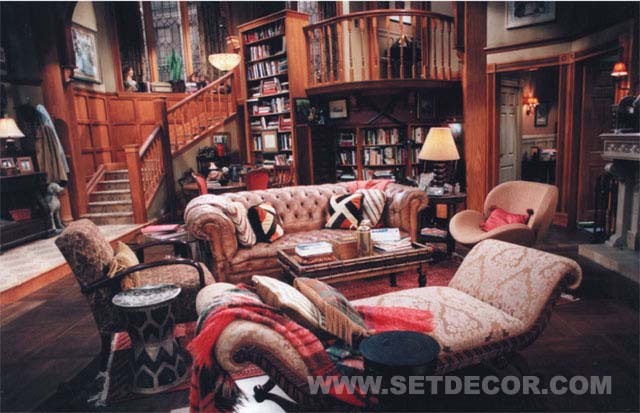 Production design, Scott Heineman; Viacom Productions. Blink of an Eye…Beautiful, well researched, multi-layered sets gone before even one full season, when a show is suddenly canceled. 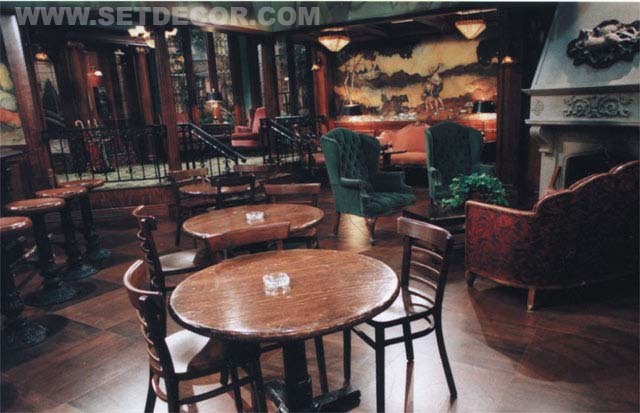 Left: BRAM & ALICE sets by FRASIER set decorator, Ron Olsen. 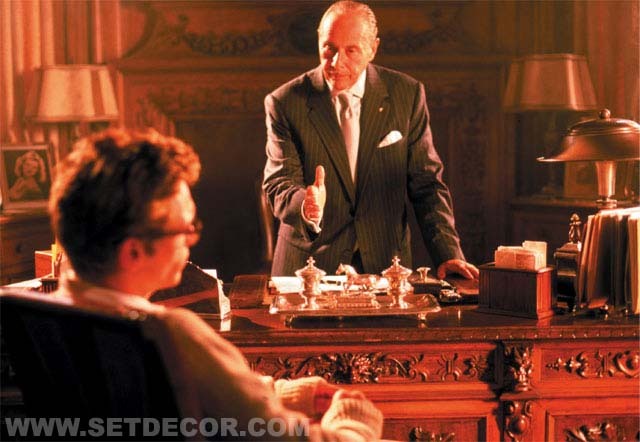 Production design, Roy Christopher; Paramount. 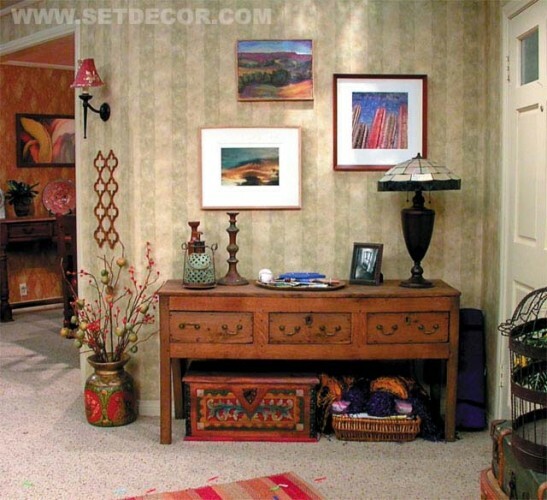 I have the rare opportunity to work with fellow SDSA member, Greg Grande, as his set decorator. Stepping out of his normal role, Greg is production designing GREETINGS FROM TUCSON. At first I was concerned that he would be too involved with the set dressing, but thankfully, the opposite is true. Greg gives me thorough, concise plans and information about the sets well ahead of time. He does not make last minute changes or additions, unless the request comes from above. The way he works saves me so much time and frustration, allowing me to be totally prepared when the set is ready to dress. Greg is never there looking over my shoulder. He gives me the freedom to create what we planned. If I have a quandary or a problem, he has valuable input, or a solution, that makes the set better. The key is his judicious input, always respecting the parameters of our positions. His approach makes my job very gratifying - I look forward to going to work every day. Stretch the Boundaries…Cable, especially HBO, brought art and the cutting edge back to television. Left: Atmosphere reigns on real time series 24, decorated by Cloudia Rebar for network television, Fox. 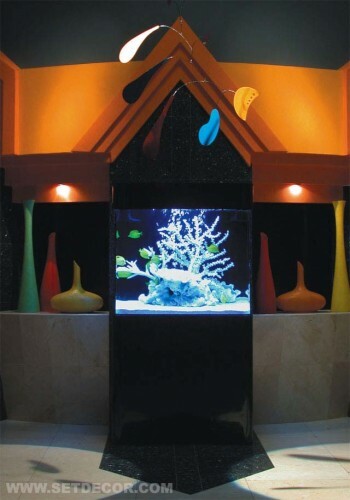 Production design by Linda Sideris. Photo courtesy of Cloudia Rebar. The Emmy…Leslie Frankenheimer’s set decoration for the TNT television movie JAMES DEAN brought her an Emmy this year. She was also nominated for the NBC series EMERIL, along with Dwight Jackson as the production designer, and is now decorating the new NBC series MISTER STERLING. JAMES DEAN required extensive period research, one of Leslie Frankenheimer's favorite aspects of set decoration. It is the digging and exciting discoveries that no doubt add the Emmy award winning touch to Frankenheimer’s sets. from REBEL WITHOUT A CAUSE used in the scene where James Dean’s character attacked his father on the living room floor. Frankenheimer credits Leadman Greg Renta for “his hard work and unending support - he’s the best of the best”; and also gives credit to producer George Perkins who put together a creative dream team, including Production Designer Rob Pearson and Art Director Mark Dabe. “Waking up and going to work everyday was a joy,” she shared. Frankenheimer’s penchant for research, re-creation of the past and artful creation of a character’s environment were invaluable assets for her atmospheric set decoration of the Depression era CARNIVALE, an HBO film/pilot airing this spring. 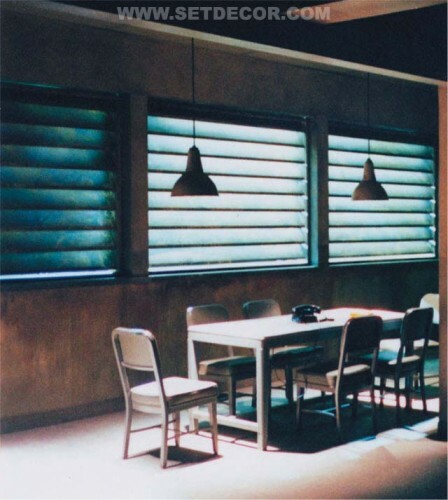 [SET DECOR Spring 2002] Frankenheimer is one of many set decorators proving that the art of filmmaking has returned to television. Left: Jack Warner’s office. Leslie Frankenhiemer’s set represented the strength of this individual and his power in the entertainment industry. Furnishings from 20th Century Props and Omega Cinema Props. Photo by Doug Hyun; courtesy of Turner Films Inc.